VICTORIAN VILLAGE STOLEN BIKE Alert! 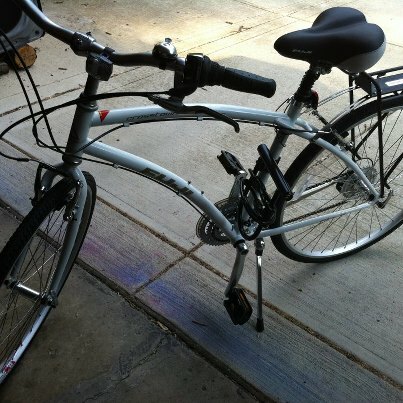 My lovely Fuji Crosstown 3.0 was stolen off of my front porch in Victorian Village Wednesday morning. It is a white (with gold lettering), 19" hybrid, that I was only just starting to understand and really enjoy. Some identifying features are a black rear rack, and if they haven't removed them by now, mounts for front/rear lights and a U-lock. I am absolutely determined to have this bike find it's way back to me; my deductible is too high to cover the cost of the bike, so I cannot afford to replace it. So please, if you see a white Fuji on one of your rides out, please let me know. I have proof of ownership and the serial on hand - which have been filed in a police report. 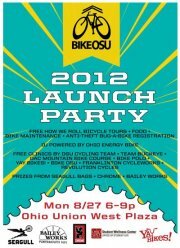 And to everyone in the Short North/Victorian Village area - bring your bikes inside. There has been a spike in bike thefts, breaking through u-lock and cables like it is no-body's business! Third Hand Bicycle Co-op is moving! HINT: THEY NEED HELP! Goobye 174 E 5th Ave! While our old space served us well, we are looking forward to expanding in the new warehouse we have purchased at 979 E 5th Ave, only one mile east of our old location! Now is crunch time. We need to be out of 174 by the end of this Friday, August 31st. Our last open shop is tomorrow, Saturday, August 25 from 1pm-4pm. We'll be packing and dismantling work benches and bike racks. Please bring empty boxes and drills (to take apart racks) if you have them. Otherwise we need as many hands on deck as possible. We'll be actually moving the following days. Please bring a large vehicle if you have one, but most importantly we need people power! Please let us know if you would like to help by emailing back or just show up! We really need your help. Email us at info@thirdhand.org. And please forward this email to your friends. Thanks! For entrepreneurs Edward Godden and Joseph Lewis, no location is too obscure for a gin and tonic. That boozy ambition has made theirTravelling Gin Co.—a roving bicycle bar—such a success. Equipped with a basket full of limes, mixers, spices and a curated selection of local gins, their cocktails are as complex any old timey bar's, without the overhead or environmental impact. Photo: Lance Armstrong. (Getty Images)AUSTIN, Texas, Aug 23, 2012 (AFP) — Lance Armstrong will be stripped of his seven Tour de France titles, the US Anti-Doping Agency said Thursday after the cycling icon announced he would no longer fight the drug charges that have stained his legacy. One morning in May, I was riding my bike up Park Avenue in the East 70s, a stretch that is rife with double-parking at that hour. Seeing a cab and another vehicle stationary ahead of me in the right-hand travel lane, I carefully checked behind and then pulled into the middle lane. As I passed the cab it began to move — parallel to me and into my lane. It was quickly clear to me that the driver saw me but meant to occupy my space, whether or not I was in it. I shouted and swerved. The driver advanced a little more, then stopped and leaned on her horn. Then, seeing an opening, she whipped around me. I thought long and hard about following through on my threat. After all, it was a trivial incident compared to the tragic crashes that kill or seriously injure cyclists in this city. What tipped the scales for me was the knowledge that bike-share would soon be adding thousands of bikes to the streets. I wanted to do my part to spread the word among cabbies that cyclists are legitimate road users, so I made a formal complaint to the TLC. I never suspected that a TLC attorney would share the driver’s view. I called Mr. Shukla for a fuller explanation. During the course of our conversation, Mr. Shukla first suggested that I should have gone around the cab to its right — a narrow and perhaps impassable space between the double-parked and parked cars. He then stated inaccurately that a bicycle is not a vehicle in the eyes of the TLC, and suggested this as the reason the agency would not pursue my claim. If I wanted clarification of the policy, he said, I could contact TLC Commissioner David Yassky. Here is my exchange with Mr. Shukla. His declaration that a bicycle is not a vehicle appears about 20 lines down. COUGHLIN: Isn’t there a rule against failing to yield to another vehicle that has the right of way? SHUKLA: There is a rule but the case as I understand it you were behind the driver and you were going around him [sic] as he [sic] moved, correct? COUGHLIN: No, I was to the left of the driver, I had to go into the other lane because she was in the right-hand lane . . . The bright white 70 meters (230Ft) tall bridge pylon can be seen from far away. 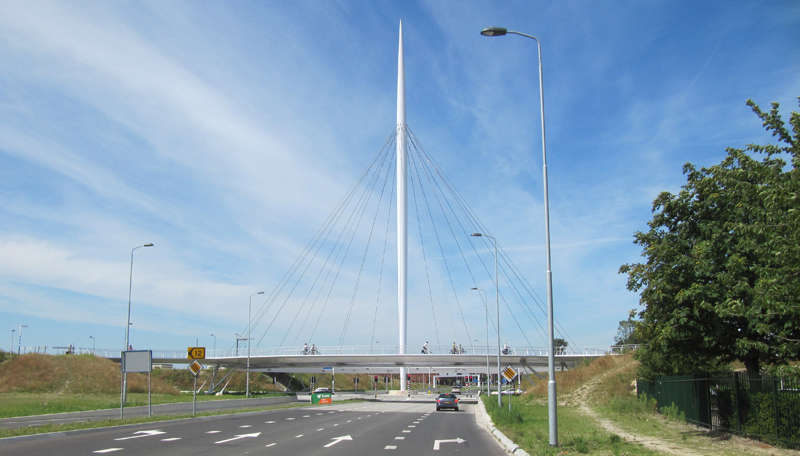 Attached to the top are 24 cables that suspend a large bicycle roundabout, 72 meters (236Ft) in diameter, that seems to float over a large new junction for motorized traffic. This roundabout can be found in Eindhoven and it is called Hovenring. The exceptional piece of bicycle infrastructure was built to stand out. It is to be the iconic new landmark that signals ‘you are entering Eindhoven’. At night the slender bike ring is lit from below to further enhance that floating effect. A new landmark for Eindhoven/Veldhoven and Meerhoven: the Hovenring floating bicycle roundabout. Thus far this was an extremely large rural roundabout (officially a ‘traffic circle’ because of the right of way arrangements) with separated cycle paths all around it. Google shows us the old situation. Google is getting outdated very quickly, because of all the new infra that is being built in the Netherlands, but as a historic reference it is perfect. Now why did this have to change? It had cycle paths and there were traffic lights to control the flow of traffic. But to the Dutch that is not safe enough anymore. Yes, there was separation, but at the places of crossing motorized traffic and cyclists were only separated in time and not in place. When people make mistakes (going through a red light for instance) this could still lead to dangerous situations. The area is full of new housing with a lot of children and especially for those kids cycling to school, the new situation is far better. Now, both types of traffic are completely separated in time and also in place, so cyclists can pass this large junction safely and without stopping. An 8-year-old girl was listed in good condition Wednesday night after she was struck by an SUV while on her bicycle and dragged at least 20 feet, according to one witness. The girl, identified by neighbors as Piper Pruitt, rode her bicycle down a private driveway, onto Conway Drive and into the path of an oncoming Chevrolet Equinox at Charlotte Drive, Ohio Highway Patrol Sgt. Erika Englund said. The accident occurred at about 5 p.m. The child, who was not wearing a helmet, suffered head and facial injuries and initially was determined to be in critical condition, Englund said. A Mad River Twp.-Enon Fire Department crew transported the child to Enon Elementary, where a waiting CareFlight helicopter took her to Dayton Children’s Medical Center, officials said at the scene. The driver of the vehicle, William Blevins, said he didn’t have time to stop or swerve as he drove west through the intersection. Englund confirmed Blevins’ vehicle had the right of way. There is no stop sign for westbound traffic at the intersection. Blevins said he’s lived in the area for 30 years and sees children frequently ride down that hill. Neighbor Leslie Brewer’s 11-year-old son Ryan said he saw the vehicle hit Piper and drag her about 20 feet, prompting him to called 911. His twin sister, Kaitlin, is best friends with Piper and also saw the crash, Leslie Brewer said. The investigation will be turned over to the Clark County Prosecutor’s Office, which will determine if charges will be filed. Minneapolis was named the country's number one city for biking last year by Bicycling magazine, but the city's bike community isn't resting on its laurels. Looking to make Minneapolis even more welcoming to cyclists, local entrepreneurs recently opened the city's first self-service bicycle repair kiosk, to serve the flat tubes and busted gears of the thousands of cyclists who travel Minneapolis's bike paths each week. The following is a guest post by Amber Hunt, and originally appeared in Visit Detroit Magazine. If you’re interested in being a guest blogger with Visit Detroit, email us atsocialmedia@visitdetroit.com with subject line: Guest Blogger. "I love my commute to work. Yeah, I said it." Most people would compare their commute to getting a root canal or listening to the sweet sound of a baby screaming. But not me. Some days I drive the 10 miles from Ferndale to Quicken Loans' headquarters on Woodward Avenue in downtown Detroit; other days I take the bus. But my favorite way to get to work is by bike. People don’t think of Detroit as a bike-friendly city, but in fact a few of Detroit’s most well-known innovators, the Dodge brothers (Horace and John) and Henry Ford, revolutionized their industry by first dabbling with bicycles. The Dodge duo invented the first ball-bearing bike and later went on to assist Ford in creating automobile engines. Ford’s first automobile, the Quadricycle, was made using four bicycle tires. See what he did there? It’s like a bicycle, but because it has FOUR wheels, he called it a Quadricycle. Oh Henry, you jester you. That little fun fact is fine and dandy, but you may be wondering why I choose to ride my bike in Detroit. The answer is simple. Biking is the best way to experience the outright beauty of the city and the renaissance that is happening on its streets. Buildings are being renovated, people are bustling around, businesses are open and active, and the city is thriving. On bike, you can see someone’s smiling face, smell the amazing breakfast at the Hudson Café and hear the music being played at Campus Martius Park. You just don’t feel that same energy if you blast by in a car. I readily encourage everyone who comes to Detroit in fairer weather to give pedaling a go. You’ll see a new side of Detroit that you might not have expected. Alabama, Alaska, Arizona, Arkansas, California, DC, Florida, Georgia, Idaho, Iowa, Maine, Maryland, Minnesota, Mississippi, Montana, N. Carolina, New Mexico, Ohio, Rhode Island, S. Carolina, Tennessee, Utah, Virginia, West Virginia, Wisconsin. We are working with our partners the International Mountain Bicycling Association and the Coalition for Recreational Trails to make sure these states don't lose critical trail funds. Recreational trails boost local economies, keep people active, and enhance personal health and well-being. If you live in one of the states listed above, please take a moment to send a strong message to your Governor to protect these trails using this easy form. The deadline for Governors to opt out is September 1, so your quick response is needed. Late model Puch road bike with lugged crom-moly frame, vintage Suntour AR components (12 speed), and Diacompe brakes. Approx. 53 cm frame size. The bike has been well-cared for and stored indoors. It is mechanically sound and ready to ride. Comes equipped with Vittoria Zaffiro city tires, comfortable Terry Gen Y saddle, and a new brushed Nitto stem. Sale also includes 2 replacement tubes and a handlebar bell. Perfect for campus commuting or city riding. Email with questions. Thanks. "Crossing this busy arterial without a signal is danger-ous," Bowman said. "The neighborhoods using the path are located along the north side." Both are Electra Cruisers: one is an Amsterdam Classic Women's with a brown basket on back, leather seat and handles; the other is a Matte Black Straight 8 with 3" Fattio Tires, red spokes. Both have bells and LED lights on them. Sad day. 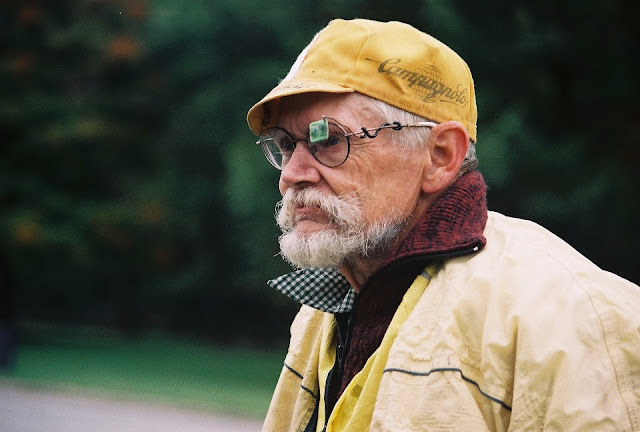 Chuck Harris was renowned among bicycle enthusiasts for his innovations and use of recycled materials. Chuck Harris was known nationally and among Ohio bicycle enthusiasts for his innovations in making customized rearview mirrors for helmets. He was a colorful fixture at bike tours in Ohio, where “the Mirror Man” would show up with his brown VW bus and handmade grinding machine mounted on a bicycle frame. Harris, 76, who had his own shop for bicyclists for years in Gambier in Knox County, died on Saturday at the Knox Community Hospital in Mount Vernon. He had been in failing health after suffering a stroke in April, said his daughter, Bonnie Coleman of Columbus’ North Side. When bicycling became a popular pastime during the 1970s, Harris was one of its innovators. Coleman said that her father — a bicyclist himself — got the idea of putting clips on mirrors after seeing a bicyclist with a dental mirror taped to his helmet. As the years went by, Harris perfected a custom-designed mirror that could hook to a bicycle helmet. It was hailed for its quality, and Coleman said her father had customers worldwide. able to meet up with Jamie Oliver and the Food Revolution movement happening in L.A.
to help youth get a great start to healthy living. Angeles on December 24th, 2012. INVITATION: Follow Jerry on 2012 Catch on Tour Facebook page. BikeCharge is a new generation dynamo system that is powerful, efficient, compact, and easy to install. It produces 5V DC power that can be used to charge any USB powered device. It is universal and fits any spoked wheel. Charges any USB powered device. All-in-one design with bike light and power generator integrated in a stylish body. Fully charges most mobile phones with 2-3 hours’ ride. 20% lighter than similar system driven by hub dynamo. Low load resistance. Zero resistance possible if not in use (by disengaging clutch). Starts to work at 5 kmh. Full capacity at 20 kmh (based on 26” wheels). Easy DIY installation. Tool-free for Quick Release wheels. 1W front LED with integrated lens optics. 2 S/B LED rear light. With 700mAh Li-ion battery for keeping lights on for 2 hrs after stop riding. Early Bicycle History in Denver from Jim Kellett on Vimeo. A composition based on the Paul Klee painting "Eros" (1923). 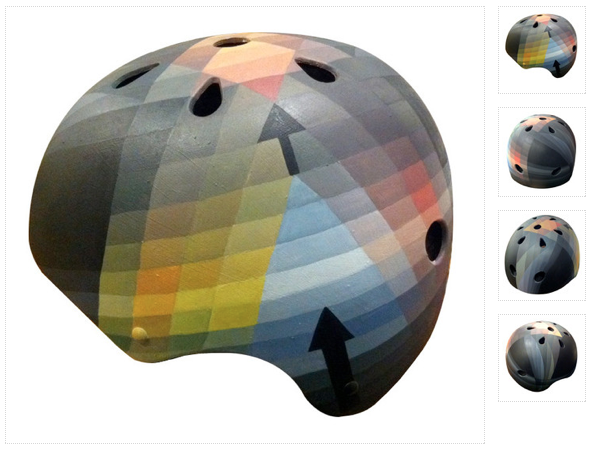 All of our helmet designs are one-of-a-kind, hand-painted with ink and acrylics, and sealed with a UV-protected varnish to make its surface scratch and water-resistant. Each helmet comes with adjustable foam padding for the perfect fit. The S/M fits head circumferences 20" - 21.75"and the L/XL fits head circumferences 22" - 23.75". Painted bicycle lanes are a thing of the past and Ottawa is on the right track for the future by starting to build a network of segregated bike lanes, according to local delegates who attended the Velo-City cycling conference in Vancouver last month. The delegates brought that message back to Ottawa during a port-mortem session on Aug. 9 organized by Citizens for Safe Cycling. Five panelists – cycling advocates and city staffers from Ottawa – shared their thoughts after attending the conference, which is the largest cycling planning conference in the world. A main theme that emerged was the need for cities to create a network of separated bicycle lanes, said Jamie Stuckless, an active transportation planner who works with Green Communities Canada in Ottawa. Imagine if you could come up with a product you could manufacture yourself. This device would weigh less than an ounce and require only three parts that can be fashioned from recycled materials, some of which you can find scattered along the roadside as you bicycle through the countryside. The tools required for manufacturing your device will fit on your kitchen table. With very little marketing effort you are approached by dozens, then hundreds, and finally thousands of enthusiastic customers. As the years roll by you find that you can support your family with your one-man, table top manufacturing plant. And some of your customers write to tell you how your simple accessory has greatly improved their bicycling experience or even saved them from serious injury or death. ADD our event photo to your FB page, Bring a print out of it, and be entered into a raffle for a CHROME hip bag!! Want to ride your bike to campus everyday?! Want to get involved with bike advocacy on campus?! Want to learn how to fix your bike?!? !